Step 1: Place a pot of water on the stove top. Add the potatoes immediately (in cold water) and bring them to a boil. Cook for 10 to 15 minutes or until fork tender. Drain and set aside. Step 2: Heat the ghee or vegetable oil in a sauté pan. Add the cumin seeds and coriander seeds to the hot oil. Swirl them around and cook until fragrant and begin to pop. Add the potatoes, turmeric, and Thai chile to the pan and stir to combine. Season with salt and pepper to taste. Continue to cook potatoes until they begin to turn golden brown and crisp. Step 3: Add the peas to the pan and cook until just warmed through, about 1 to 2 minutes. 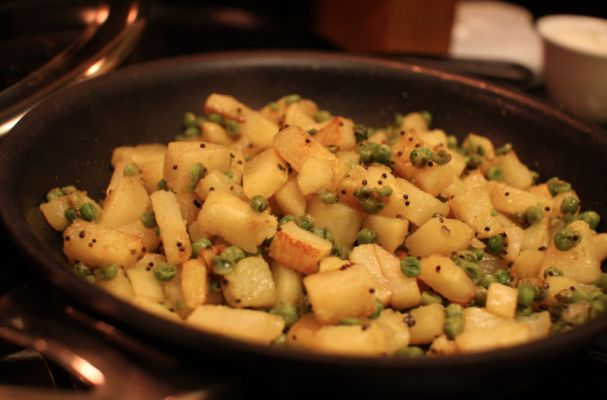 Remove potatoes from heat and toss with fresh chopped cilantro.